'The Travel Detective' Explains How Airlines Became A 'Mafia' Airlines are making record profits, but more fees and flight cancellations haven't made air travel great recently. Travel journalist Peter Greenberg talks about the reasons why. Here's a quick tip from a veteran traveler for the next time you're taking a flight: When you get to the airport, disavow the departure time you see on the board. Instead, take the gate number and see what time the next flight is arriving there. "Departure boards haven't told the truth since 1947. 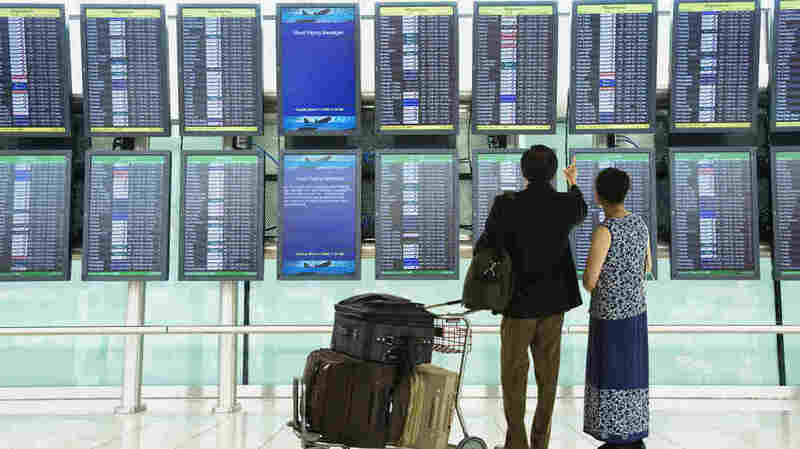 All the departure board is really telling you is what time the plane is supposed to leave," says Peter Greenberg, "The Travel Detective," who is an author and travel editor for CBS News. "If nothing's arriving at that gate until next Tuesday, why would you ever go to that gate? You're not going." The key to traveling, he says, is to get information before everyone else and adjust your plans first. If you're counting on the airlines to send you alerts, it's already too late. Any tiny advantage is good in the world of airline travel — with small seats, diminishing free food options, more baggage charges, and large-scale computer problems causing cancellations. You would think that fees for things that used to be free would indicate an industry struggling to raise profits. But the airline industry is set to take in record profits of $39.4 billion in 2016, according to the International Air Transport Association, an industry trade group. To explain this discrepancy, Greenberg talked with NPR's Scott Simon about how the industry works and how it's changed over the past 20 years. If the airlines are telling the truth, they've gone from being in the travel business to being in the human transportation business. It's all a numbers game. In order to understand what they've done, you need to go back about 20 years. Because 20 years ago, you had about 10 airlines competing for 88 percent of the market share. Today, because of mergers, consolidations — and in some cases, outright failures — you've got four airlines that own 88 percent of the market share. So the need to compete has sort of evaporated. Because imagine four mafia families, in the days of The Godfather. You know, somebody does numbers, somebody does drugs, somebody does prostitution — and nobody goes into anybody else's territory and everybody wins. It's true. And if you actually add to that, the airlines finally got disciplined when it came to capacity. They started reducing capacity when they no longer had the need to go fly to everywhere. There was a time when airlines felt they had to fly everywhere. Now, they only fly not for market share, but they fly for yield — how much they can get for any individual seat. So that explains in a way why almost every plane I've been on in the last three years is full; why many people find themselves sitting in the center seat next to the two sumo wrestlers. And, as a result ... we define a successful trip by how much we minimize the abuse. On the what it means to have a "terrible trip"
I get phone calls all the time and emails all the time from people who are just outraged about the worst trip they've ever taken in their life, how it was horrendous, and it was worse than fighting in a war. And I always ask them two questions. Question number one: At any time during the flight, did you hit a mountain? No, you didn't. And question number two is: When you landed, did the wings cartwheel and explode into flames? You didn't have a terrible trip, you had the best trip ever, because you're alive. Why do we really go to travel anyway? To go from point A to point B and not die. I mean, I'm always reminded — and I travel over 400,000 miles a year, those are real miles. I'm reminded every time I get in this aluminum cylinder how amazing this experience is. Recently Congress agreed on something. I know that sounds amazing, but they did, and they passed the FAA reauthorization bill, which the president is signing. Tacked onto that bill ... is a requirement now that airlines must seat families together without charging them additional money. Good news at the end of the day is how people can put things in perspective and realize that the real key to flying these days is how to beat the airlines at their own game, playing by their rules — not my rules, not your rules — their rules. And it's capable of being done; it's possible to do it. I do it every day.